This article is for those people who have a great acount of DVD discs, share two methods to rip your DVD discs, with Handbrake and DVD Ripper. If you think it is useful, please share with others. There are lots of programs available to help you do the DVD ripping task, but we bet you favorite program is the HandBrake, a completely free DVD ripper software wit a high reputation. 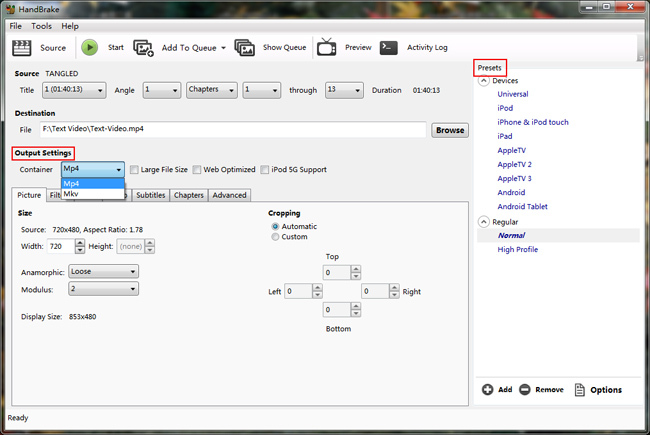 Now we will guide you through the steps how you can rip DVD with Handbrake for free. NOTE: To rip encrypted DVDs, you’ll need the DVD43 plug-in, which circumvents the publisher’s digital rights management technology. Such procedures currently occupy something of a legal gray area. You probably won’t face any legal consequences if you simply rip your legally purchased movie collection for your own use, but we’re just going to present the instructions and let you decide for yourself whether to follow the steps. Make HandBrake downloaded and installed on your computer. The default interface of HandBrake can be seen as below. After launching HandBrake, you can open the drop-down menu of “Source”, then click “Open Folder” option to load DVD movie from computer hard drive. If you want to load DVD movie from disc, please make the disc inserted into computer DVD drive firstly then click “Source” button to do the disc loading. Tips: When handbrake finishes the DVD loading, you can click “Title” drop-down button under “Source” section to choose the title you want to rip. If you hope to rip the main movie, just select the title with the longest run time. Otherwise, you might end up with a rip of the preview or the DVD menu, but not the actual movie. Generally, the program will select the main movie for output by default. Under “Destination” option, you can click “Browse” button to navigate to where you want to save the output file, and meanwhile type in a file name in the pop-up menu. Then, click “OK”. Under “Output Settings” section, you can choose desired output format (MP4 or MKV) from “Container” box. If needed, you can do some settings under “Picture”, “Filters”, “Video”, “Audio”, “Subtitles”, “Chapters” and “Advanced” sections. Tips: HandBrake offers some handy presets on the right side of the main interface. 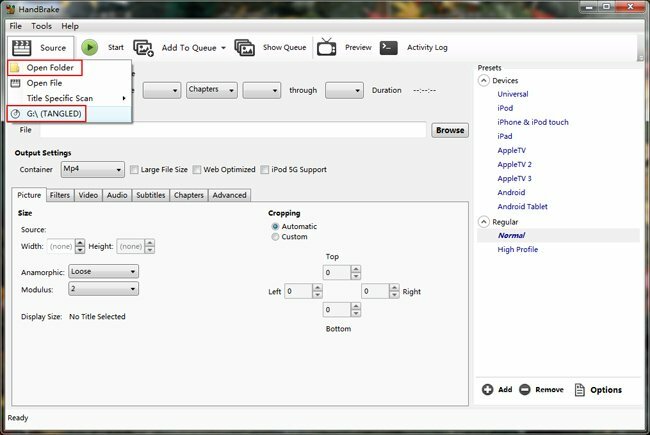 When done with all settings, you can click “Start” button on program top menu bar to start to convert DVD with HandBrake. Then full process of ripping DVD with HandBrake can be checked at the bottom of program interface. The conversion time depends on your original video length, output video settings, you CPU, etc. During the conversion, you can stop or pause the process at any time you like. After the conversion, Handbrake will show you a window saying that your Handbrake queue is done. You probably have found out that it’s very complex to operate the HandBrake. What’s more, HandBrake has no support for encrypted DVDs. So if you are looking for ripping a copy protected DVD much easily and quickly, you’re much better off getting a solution like Brorsoft DVD Ripper, which can not only rip just about any DVD, but can convert it into any format you want really easily.